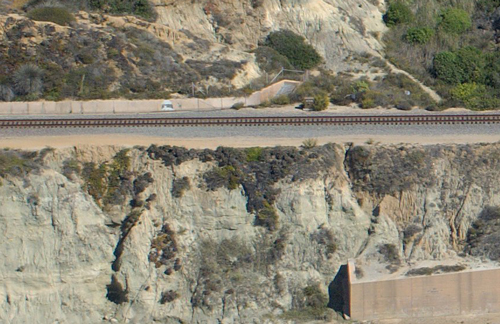 The North County Transit District (NCTD) of San Diego County, California, determined that three segments of railway track above coastal bluffs in Del Mar should be monitored for dangerous slope movement. This led to the development of a continuous monitoring system along 3,300 ft (1,000 m) of track. Because of the length to be monitored, the use of conventional single-point monitoring systems such as multiple tiltmeters or in-place inclinometers (IPIs) was impractical. Bluff failure could occur anywhere along the track, so the use of single-point instruments would require a large number of sensors and monitors. Instead, it was proposed to install horizontal time-domain reflectometry (TDR) coaxial cable sensors along high-concern segments of the track. The TDR monitoring system works similarly to radar. It uses a coaxial cable as a sensor, with any slope movement deforming or shearing the cable at the location of movement. When a voltage pulse from a reflectometer encounters a deformation, or the end of the sensor, the amount of reflected energy is proportional to the extent of the deformation. The reflectometer accurately determines the location of the deformation and the relative extent of movement as noted by the magnitude of the reflection. The monitored area consisted of coastal bluffs prone to erosion and relatively small block failures. The bluffs were about 50 ft (15 m) above the beach. Railroad tracks along the bluffs ranged from as little as 20 ft (6 m) to as much as 100 ft (30 m) from the edge of the bluff. Although the bluffs appeared stable, there had been some erosion problems that required soldier-pile walls, drainage enhancements, and shotcrete reinforcement. In addition, about fifty years earlier, one segment of the bluff had failed, causing the wreck of a freight train. The bluffs are made up of relatively strong (but fractured and jointed) sandstone and soft and erodible siltstone. Wave action and a significant amount of ground water from landscape irrigation contributed to weakening and softening of the siltstone. The result was the undermining of the sandstone, followed by local coastal bluff failure. The remote data acquisition equipment included dataloggers, multiplexers, and communication devices. In addition, software was necessary to program and interact with the datalogger. TDR is a relatively new approach to monitoring slope movement. Originally developed to locate breaks and faults in communication and power lines, this technology uses coaxial cable as the sensor and a time domain reflectometer for measurement. A multiplexer was used to allow multiple sensors to be attached to a single datalogger. The multiplexer is wired to a single set of ports on the datalogger. The data is collected sequentially by the logger. Multiplexers can even be multiplexed to each other, creating the ability to read a large number of instruments. The monitoring system consisted of a central control and monitoring unit and three TDR monitoring stations. The central monitoring unit checked the status of each monitoring station and controlled the alert notification function of the system. The TDR monitoring stations each polled two TDR sensor cables for cable deformation or break. At each monitoring station were a Campbell Scientific CR10X datalogger, SDMX50 TDR multiplexer, and TDR100 reflectometer. The datalogger polled two horizontal TDR cables every four minutes and compared the reflected waveform to a baseline signature. If the reflected data indicated a deformed or broken cable, an alert signal consisting of 5 Vdc was applied to a wire monitored by the CR23X Micrologger at the central control and monitoring unit. There, an automated telephone dialer notified railway personnel of possible bluff movement. Personnel could then contact the system by telephone and determine the location of the cable deformation so that a safety inspection of the bluff and track could be made. The datalogger was capable of distinguishing between a low-level alert (deformed cable indicating small movement), and a high-level alert (sheared cable and possible large magnitude slope failure). TDR sensor cables were routed under the tracks and installed parallel to the tracks in a shallow trench. The cables were enclosed in a cement/sand grout to ensure deformation should a slope movement occur. A total of approximately 3,300 ft (1,000 m) of sensor cable was installed. Each datalogger was connected to a Campbell Scientific MD9 multidrop interface. RG59 coaxial cable was used to connect these network nodes. At the central monitoring station, an additional MD9 accessed the network dataloggers through the telephone line. In addition to the modem, three autodialers also used the telephone line. When activated, the dialers called up to eight telephone numbers and delivered an alert message applicable to the type of action required. Coaxial sensor cables were installed using a tractor-mounted trencher. Trenches were cut 2 ft (0.7 m) deep parallel to the tracks about 13 ft (4 m) from the track center line between the track and the bluff edge. A 2-in. (50-mm) layer of lean concrete was placed on the bottom of the trench and the sensor cable was laid on top. An additional 1 ft (0.3 m) of concrete was placed on top of the cable. After the concrete set, the remainder of the trench was backfilled with compacted fill. This project represents one of the largest single applications to date of TDR slope monitoring with movement alerting capability. A major benefit of the alerting feature was the ability of each monitoring station to call up to eight different phone numbers to notify personnel of a possible failure condition. Each of the three dialers was dedicated to one of the remote monitoring stations. For example, a sensor deformation on Remote Monitoring Station 2 would trigger calls to eight individuals to alert them of a possible slope movement in the vicinity of Station 2. In addition, the extent of the area monitored has excellent potential for safeguarding railroads and highways wherever they are threatened by dangerous slope movements. William F. Kane, PhD - KANE GeoTech, Inc.